This year people have started to realise how much plastic is destroying our planet. You have many rivers and oceans flooded with plastic cups and bottles. Animals dying because of human consumption and of course the ever-increasing issue of climate change. Those paper disposable cups you are using, are adding to the problem. Did you know that almost all coffee cups are not recyclable? Therefore to reduce the amount of waste created, investing in a good reusable cup would make all the difference. Those disposable cups that you use for the afternoon-pick-me-up latte in the high street chains (Starbucks &Costa etc.) actually contain 5% of polyurethane plastic. This plastic is added to the cup to ensure the liquid doesn’t leak through the cardboard. So that you can enjoy the drink rather than it spilling over your hands. But of course it is this 5% of plastic that makes the coffee cups non-recyclable. Despite the fact, many of us think we are doing the correct thing by sticking the cup in the recycling bin. Unfortunately it’s not the whole cup that gets recycled by doing this. I was doing some research and found out that it’s only the sleeve that is recycled. The rest of the cup is thrown into landfill. How annoying, so we are never actually recycling properly. In addition to that most coffee cups are made out of fresh paper not recycled paper, so obviously trees need to be chopped down for that. The paper industry cuts down about 4 billion trees for human use, including the coffee cup production. The production of disposable cups leads to an increase in CO2 emissions, as well as the deforestation of trees before the creation of these cups. Adding to the issue that is climate change, which is already such a huge problem that we are facing. We need to sit back and consider what we are using and contributing to in our daily lives. By choosing to use a reusable coffee cup, you stop adding to the seven million cups used each day in the UK. What’s not to love about that, saving the planet which in my opinion is pretty awesome. Cut your disposables, Cut deforestation. A reusable will last you a good few years, or more if you don’t drink coffee on the regular. For me, I used to drink about 7 cups of coffee a day (I know its not healthy at all) using my reusable cups each and every time; they are still going strong. I own 3 different cups, all from different brands, but I love each one so I use them all. However, recently I have stopped drinking coffee all together, and now use my cups for smoothies or iced tea when I’m looking a drink on the go. I think that taking out the single use products from your life, would be a great way to go in terms of lowering the amount of waste you produce as well reducing the amount of cups and straws found washing up onto beaches, harming wildlife and poisoning the water quality. 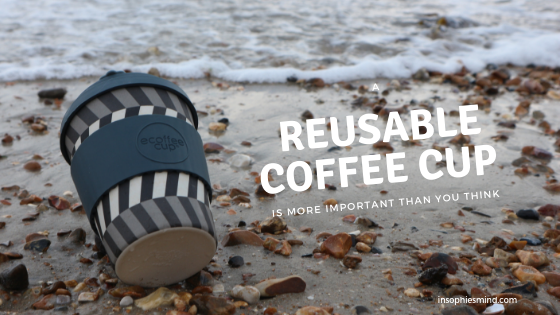 However, luckily there are some great brands out there that have reusable coffee cups such as (Keep Cup, Eco Lunchware, Ecoffee Cup, Joco Cups). Even now I have seen the bamboo coffee cups in UK bargain stores. You don’t have an excuse not to have one these days. Coffee cups should not be found in our oceans nor should they be the cause of animal death. Let’s change the way we live today so that our tomorrow can be more sustainable.